Century Cycles Blog: 26,673 miles biked for 5th Bay Bike To School! 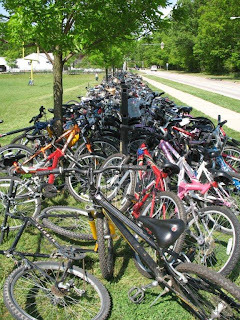 538 bikes parked at Bay Middle School on National Bike To School Day on May 9, which coincided with Bay Bike To School Challenge. They saved their parents $4,466 on gasoline, based on the current Ohio average gas price of $3.75/gallon. They burned 453,441 calories just biking to school -- or the equivalent of 1,679 Snickers bars! An average of 474 Bay Middle School students biked each day of the challenge, a whopping 59% of the school’s enrollment of 793 students. Bay Middle School’s highest ride day during the challenge was May 18, when 611 students (a gigantic 77% of the school!) bicycled. At Bay High School, an average of 135 students per day biked, or 16% of the school. Since Bay Bike To School Challenge began in 2008, Bay students have biked 129,476 miles and saved an estimated 142,423 pounds of CO2 emissions. This was the fifth year for Bay Bike To School Challenge. Main sponsors Century Cycles bicycle store in Rocky River and bicycle manufacturer Raleigh Bicycles teamed up to give away two grand prize bicycles per school. Winners of the Raleigh bicycles at Bay High School were Cullen Brewer and Claire Mercer, both freshmen pictured below. Cullen and Claire are presented with their grand prize Raleigh bikes by Sean Burkey and Chris Speyer from Raleigh Bicycles (at left), Century Cycles owner Scott Cowan (center), and BHS Principal Jason Martin (far right). At Bay Middle School, sixth-grader Ellen Brabant and fifth-grader Kate Baeppler won Raleigh bicycles. They are pictured below with Raleigh's Chris Speyer (far left) and BMS teacher Lawrence Kuh, who (along with BHS teacher Eryn Sutterlin) was presented with a new Raleigh bicycle in honor of their commitment to youth bicycling in Bay Village and their leadership, hard work and enthusiasm for Bay Bike To School Challenge. In addition, Raleigh Bicycles awarded $1,000 Bike To School Challenge scholarships to Bay High School seniors Gideon Lorete and Jamie Kerka. Raleigh Bicycles also gave each school a $500 award for exceeding its bicycling goals during the challenge, to use for fitness and bicycling programs, and committed $750 to the Bay Skate and Bike Park Foundation and Bay Village Green Team for the “Share The Road” signs throughout the city. The Bay Bike To School Challenge t-shirt design contest was won by Elyse Sopa, a junior at Bay High School. She won a prize package from Century Cycles and Project Earth Environmental Club, and her winning design is featured on the front of the shirt given by Century Cycles to every student who biked to school four days during the challenge. Speyer also noted that bike stores in New Hampshire, Oklahoma, California and Minnesota are inspired Bay Village’s program and are eager to use it as a template for their own bike-to-school efforts. Other sponsors who contributed prizes and support to make the program possible were Honey Hut Ice Cream, Subway of Bay Village, Bay Village Kiwanis, Bay PTA, Project Earth Environmental Club and the Bay Skate and Bike Park Foundation. Grand prizes were also donated by Bay Village Recreation Department, SportsTime Ohio, Cleveland Coca-Cola Bottling Company, Earth Day Coalition and Ray’s Indoor Mountain Bike Park.